Trump creates another unnecessary crisis on his visit to NATO. Trump has created another unnecessary crisis by failing to endorse NATO’s core principle. Donald Trump did not clear even this basic hurdle of American leadership. Expectations were low for the European leg of President Trump’s first trip abroad, but it turns out they weren’t low enough. For most presidents, this is a rather low bar akin to the proclamation, in their annual address to Congress, that the state of the union is strong. 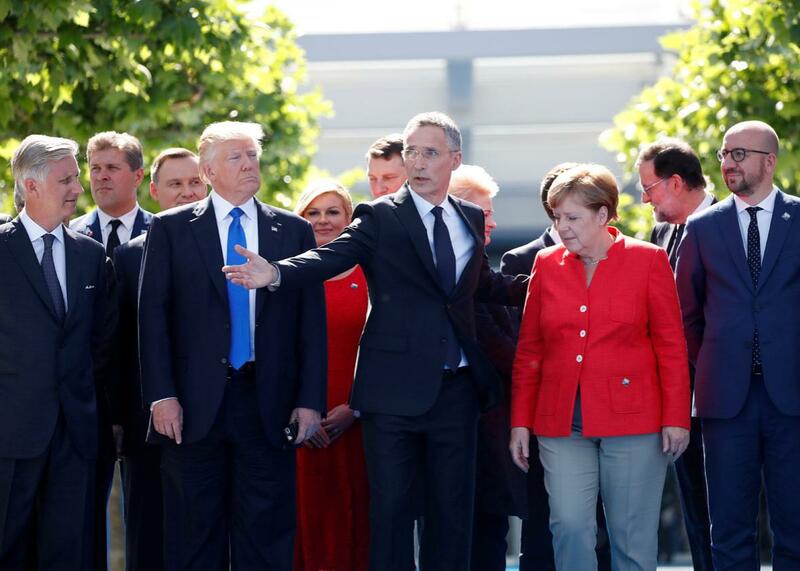 But Donald Trump, in his brief speech on Thursday at NATO’s new headquarters, did not clear even this basic hurdle of American leadership. European leaders had been nervous about this visit, well-aware of Trump’s repeated statements that NATO is “obsolete” and that he might not defend a NATO ally from attack if it’s fallen short of commitments on defense spending—like some Trump Tower tenant delinquent on his rent. He made most of those statements during the 2016 campaign, but even since taking office, he hadn’t clarified his stance on the alliance. Trump has said that NATO is no longer obsolete since it has now declared a policy against terrorism—for which he has taken credit—ignoring the fact that the non-American members adopted such a policy in 2002 and have since lost 1,000 troops in the war on terrorists in Afghanistan. But the allied leaders have stayed mum on this, hoping that giving Trump a rhetorical win, with an apparent nod to his wisdom, would make him a more amenable partner. Apparently their modest hopes were overwrought. Trump began his eight-minute speech noting the two monuments in the new courtyard—shards of the Berlin Wall and the World Trade Center—as symbols of “remembrance and resolve.” He even recalled that, after the Sept. 11 attacks, the NATO allies responded swiftly by invoking Article 5, the first and so far only time any member had done so since the treaty’s signing in 1949. Trump is hardly the first American president to call on allies to pony up more for their own defenses—President Jimmy Carter demanded that they each devote 3 percent of GDP to the military—and some allies have started spending more in part due to this recent pressure. But Trump is the first president to refrain from assuring the allies that he views the defense of Europe as a vital American interest. His silence on this matter also puts him at odds with his secretary of defense, secretary of state, and national security adviser, who have all gone out of their way to express this commitment—reviving the question of just who controls U.S. foreign policy. Since the start of his presidency, Trump’s advisers have waged a power struggle over this issue in particular: nationalism vs. globalism, leadership of the free world vs. America First. His speech in Brussels suggests that this struggle is still raging. It is possible—unlikely but possible—that Trump is using his position on Article 5 as a bargaining chip for the allies’ promise to spend more on their defense. If so, it’s a misguided game: The defining article of a vital treaty is not to be toyed with or made conditional on some arbitrary fee. He’s sending dangerous signals both to allies, who may start to doubt America’s word and seek security elsewhere, and to adversaries, who may see the shrug as a temptation to take aggressive risks. Whatever his motives or thoughts, Trump has taken what could have been an easy stopover—the allied leaders set up the meeting (less formal than a summit) for it to be just that—and turned it into another self-inflicted crisis.